Good Tuesday morning all , the sun is shining and the snow is melting can't help but be in a really good mood . Today I am going to review another new author to me Dariel Raye and Muffy Wilson and their novella DEATH'S SHADOW . 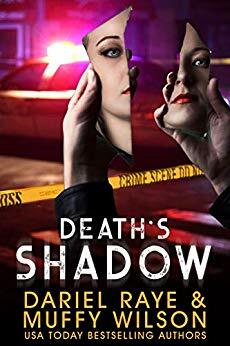 Brianna’s quest to find her sister’s murderer despite the police department’s refusal to help, draws her into a life of drugs, alcohol, and prostitution—the very elements that led her twin to the shadows and rat holes of the underbelly of North Beach. When Brianna Denton's sister is missing and the case has gon cold . She takes it upon herself to find out who murdered her .The police have stopped looking there is no body, so Brianna goes undercover to the streets and enters the life of drugs , alcohol and prostitution but there is more to the story and when she meets Dr. Ben James she starts to remember the past and what truly happens to her is unbelievable. I was actually blown away by these characters , they are so well crafted and complex . Brianna well she is tough as nails when you first meet her but as you see her you just want to wrap her up and hug her . She is hurting so much and she just needs to be loved and to give love . She has such a vulnerability that will touch your heart . Dr Ben is well he is a protector and a great guy with a hidden past . You will either like him or hate him . Sometimes you just don't get the read on him and when you finally figure him out you will love him . I settled down and read this book in an evening and once i started reading i couldn't put it down. I wanted to find out if she found her sister and what happened . The author takes us on a journey full of twists and turns that will have you going what the heck through out the book . There is only one issue i have with the book and i wish it was longer and we got to dive into the two main characters a little bit more . I feel like its just the tip of the ice berg and i wanted more . I truly enjoyed this book and wow the twist at the end had me reading over it twice cause i wasn't sure the twist was real or not . So if you have an evening to dive into a good book check it out . You will love it .